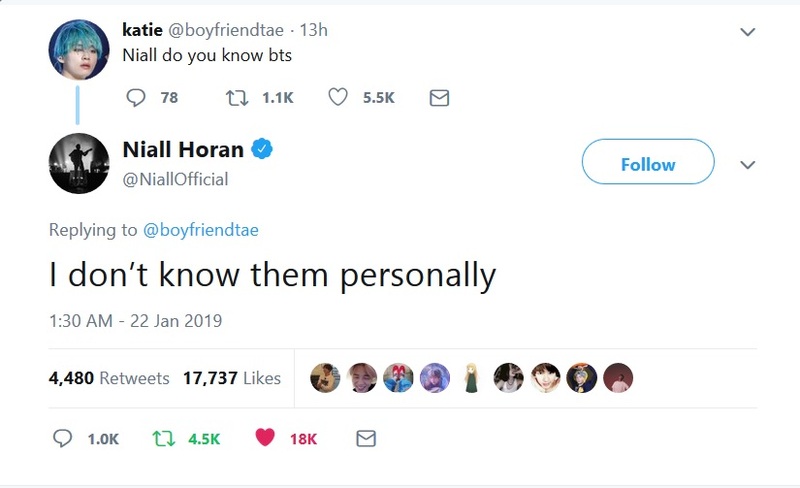 Niall Horan a member of the famous One Direction Boy band had responded to a random question of a BTS ARMY, katie‏ @boyfriendtae, about the current biggest boy band in the world – BTS. And to the amazement of other ARMYs, the One Directioner replied. Although not in the affirmative, the fact that he replied is even more surprising, as apparently, he was not tagged in the tweet. The exchange didn’t go unnoticed by international ARMYs, who reacted positively, and some even requested for collaboration with the Bangtan Boys. The power of the ARMY fandom comes to play once again. Earlier last week, Jungkook mentioned that he was using Downy in one of his vlive chats. As a result, hordes of fans had reportedly bought the product, so that the Golden Maknae was not able to buy any, when he attempted to buy one. For ARMYs, who are also One Direction fans, a collaboration of these two great boy bands would be an awesome goal that they could look forward to.